Are you trying to make flash games for a living, but having a hard time making ends meet? Have you made an engaging & fun game, then spent months polishing and tweaking it to perfection before releasing it onto the world? Maybe you got it right and it's a hit – it's been played and enjoyed by literally millions of people! 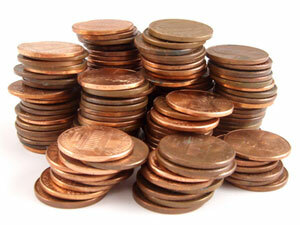 Well time to sit back and watch the pennies roll in, my friend, because that's all you're going to be getting. 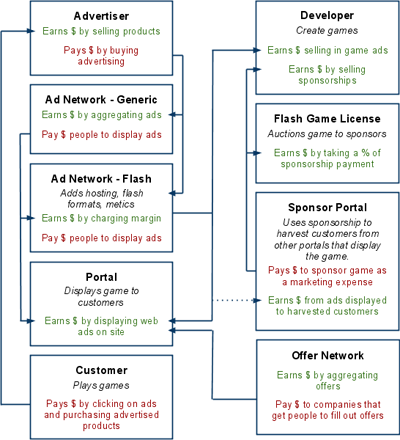 This may sound alarming, but it's what most flash game developers have experienced using what I call the 'Ad Model' of monetisation. Sponsorship: this is where a portal pays the developer to 'tag' their game with the portal's branding (and usually a 'more games' link), effectively paying for traffic delivered to the portal as the game is distributed around the internet. FlashGameLicense was set up to help developers find sponsors for their games, and it has proven to be very effective. Generally speaking you can, and should, use all these options at once as Ada Chen advised in a talk she gave at Casual Connect in 2008. This model is working for some developers, the ones who can efficiently make engaging, short flash games and keep churning them out, but it's really only been a success for very few. Most flash game developers are still relying on other sources than ad-funded games to keep going full-time (for example, making games on contract for third parties). The guys making the big bucks here are the ones aggregating lots of games and leveraging massive visitor traffic (like the big games portals), or else delivering a solution used by all developers and getting an aggregated margin that way (like the ad companies). Individual developers simply cannot get the high levels of traffic necessary for ad-funded solutions to bring in the (serious) cash. Luckily there's a better way to fund game development than scrounging for ad-pennies. It's been proven in almost every form of consumer entertainment ever made, from theatre to music to cinema and yes, even games: ask the consumer of the entertainment to pay you for providing it. That's it. Asking the players to fund game development takes away the dilution effect of trying to get ads to pay everyone's cut, and directly rewards the developer regardless of the size of their 'aggregated traffic-power'. It works for all those other kinds of entertainment, and it certainly works for the rest of the gaming industry. And it can work for flash games too. Several developers have been successfully charging players for full versions of their free flash games, by integrating a payment processor such as PayPal. This method (often called a "demo", write that down) is so proven that almost no console or PC game doesn't use it. Others have tried splitting out the purchase into smaller bundles using a microtransaction/virtual currency provider, and are charging for decorative things like a fancy hat or small upgrades like level packs and new weapons instead of selling the whole game in one go. In fact recently launched providers such as MochiCoins, GamerSafe and Heyzap have made it easier than ever for flash developers to take payments from players. One advantage of the idea of using virtual items, temporary powerups, or other small purchases is that you aren't putting a cap on how much your biggest fans are able to spend on your game. Generally speaking selling virtual items works best in a persistant-world / MMO style of game, where you can put all kinds of social and economic effects into play to really leverage the idea – just look at this breakdown. Regardless of how you are charging players, or what they are paying for, the fact that you are charging at all means you are using what I call the 'Premium Flash Game' revenue model. One downside to charging money upfront is that you need to make players fall in love with your game before they will pull out the credit card, and that means spending a lot more time polishing the gameplay and expanding the content before release. The quality level of today's (and yesterday's!) flash games is definitely high enough to convince players to pay – developers just need to focus on expanding the experience; make "long form games" instead of focusing on quick, throw-away games. Again no one's explained this better than Dan Cook, so make sure to read his Flash Love Letter, Part 2 – you can do it right now if you like, we'll pause this part of the internet until you come back. Lets have a look at some real-world examples of revenue made by flash developers using the Ad Model, and compare them to ones using the Premium Model. I'm going to use 'Gross eCPM', a term I just made up, as the baseline stat to compare these ad-based apples versus premium oranges. If you aren't familiar with it, eCPM is an advertiser's term and stands for effective cost-per-mille – or how much an advertiser has to pay out per 1,000 impressions of their ad on average. As the payee, you can think of it as how much revenue you made per thousand plays of your ad-enabled game. What I call Gross eCPM is calculated by taking the total amount of plays of a game, and dividing it by the total revenue made from them (whether it be from ads, sponsorship, microtransactions or full game purchases). This handily lets us compare two very different ways of monetising with a single comparative number. One of the original 'break out hits' of modern free flash games, created by a single developer, and supported by ads inside & around the game. Another game created by a single developer, and supported largely by revenue share on ads on Kongregate. A free-to-play flash game, hosted on it's own site plus some portals, with a premium unlock for $10 that let you make your own levels and play other people's custom levels. Included solution-sharing via unique URL that helped it spread virally. Total Plays: "over 3.5M unique users in the first 3 or so months"
Total Plays: "over 10 million plays"
Gross eCPM: an ARPU of $0.40 was mentioned by the developer, which means $0.40 revenue per unique player. My Gross eCPM counts total plays rather than unique plays, but if we ignore that we would get a Gross eCPM of $400; if we had the 'total plays' number this would be lower – but not all that much lower. That's a massive, orders-of-magnitude difference between the revenue rate for ad-funded flash games and premium flash games. And once you start charging the players instead of hoping for ad money, the sky's the limit. Puzzle Pirates, a casual MMO run by Three Rings revealed last year that they make make an ARPU of ~$1.50 per player, per month – which would give a comparative Gross eCPM of ~$1,500. Yep. Edit: Daniel James (Three Rings CEO) left a comment giving me a much better way to calculate a comparable 'Gross eCPM' for Puzzle Pirates. He says for every 1,000 new visitors to the site they get about 100 who actually download & play, leading to a lifetime value of about $200-$500; so a better 'Gross eCPM' for Puzzle Pirates (over many months) is ~$200-500. I hope this has convinced you, the flash game developer, to seriously consider moving away from the Ad Model and moving into Premium Flash Games. It's the future – embrace it. PS- Many thanks to all the flash developers who have shared their revenue numbers with the rest of the industry. We too will be doing this as we work on our first game. This post has also been published on the Mochi Land blog. Thanks Mochi! Wow, that's a pretty staggering difference. I don't make flash games for a living, but maybe I should ;) Thanks for putting the effort into gathering that data. The Puzzle Pirates numbers you have are not really comparable; only ~10% of landings get to playing PP (download, funnel) and the $1.50 number is representative of an ongoing player population not a cohort of new players. At a guess the lifetime value of 1,000 new players (10,000 landings) is around $2-5,000 lifetime (over many months) so a ~$200-500 eCPM is perhaps a decent-ish comparable. Otherwise good post and I agree. Flash devs should also check out Whirled.com! Cheers for the clarification Daniel. That's actually a much better way of getting a 'Gross eCPM' for persistant games, matching up more closely to the Ad Model games calculation. I'll update the article. I agree Flash is a great tool, how about a generic service like this that exposes a generic leaderboard service to small game developers? Flash would be the perfect rendering tool for the idea. Amazing post! I knew that making games was profitable (I have a friend who does that), but I didn't know it was that profitable! I'd love to know how much the bloon tower defence games have made (all 4 games earnings). Think i'll forget learning jQuery and move onto flash! I'm pretty sure my game is 'premium'. Let's hope so, I plan to post it on FGL next month! Yeah, I heard fantastic contraption actually hit the million mark. But I think most flash games wouldn't be successful at all at this model. For it to work, the game must have at least some replaying value and potentially multiplayer mode. It's the same model those little games from facebook are using, actually. How much does it cost to make your own flash game? is there somewhere i can go to have a person make me one?